Aisha Fukushima’s talent is a sumptuous buffet: singer, poet, RAPtivist (rap activist), educator and then some. The list is almost as long as her travel itinerary, which spans 20 countries across four continents. Fukushima will share this bounty with American River College during ARC’s upcoming Artivism event on Tuesday, April 4. Artivism, a portmanteau of the words art and activism, is part of a world-wide phenomenon where artists of all genres use artistic expression to move forward the dialogue of social justice. Fukushima, who holds an honors degree in Rhetoric and Film Studies from Whitman College, said that growing up as a multiracial child in the Northwest, she saw a lot of injustices happen. “I saw people going through adversity around me, but I also saw them express what they can do through hip-hop…I started to write poetry to turn off the stereotypes” Fukushima said. As a young child growing up between Seattle, Washington and Yokohama, Japan, Fukushima developed an awareness of where issues like racism, sexism, homophobia and poverty intersect and as a performing artist, Fukushima’s goal is to “challenge oppression with expression” with hip-hop. Artivism is about communicating your vision to the masses in a way they embrace; for Fukushima, the match was a natural one because of hip-hop’s universal appeal. “Hip-hop is all over the world, you don’t need a lot of materials…you don’t need a million dollars to do a dope rhyme. It can leverage mass appeal into social action,” Fukushima said. Artivism is the latest incarnation of using creativity to fight against injustice. It’s catching on. 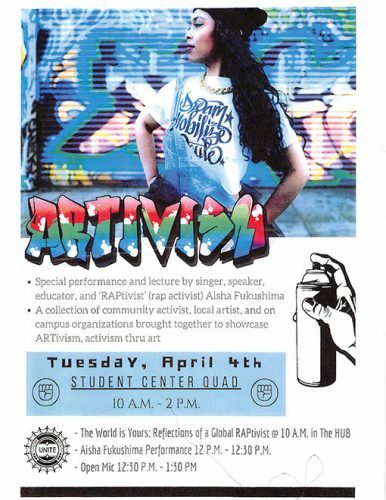 An internet search will show a growing plethora of colleges and universities around the country that sponsor yearly Artivism events and ARC is no different. This is ARC’s second year of demonstrating a strong commitment to art and activism as well as the Artivists that dedicate their talents to creating a better world. “I believe that allowing students a way to express themselves artistically, gives them a chance to voice their concerns, thoughts, and emotions in a personal and artistic way that can be shared with everyone. … I also believe art helps create a community through a shared an experience, since art helps provoke conversations and critical thoughts. With Artivism, it helps combine the impact of art to bring light to issues that the community is dealing with and to help continue the fight against oppression and social injustices.” said Roderic Agbunag, U.N.I.T.E. ARC Community and Diversity Center Coordinator. According to Fukushima, students need to hold their college campuses accountable for diversity or lack thereof. “Shaping the way that people think can change the world. Dare to imagine beyond the status quo by building a platform of respect. It’s about listening and showing up.”Fukushim said. Solange is a first-semester student on the Current. She is majoring in journalism and hosts the Friday Morning Blues Program and Libro Abierto radio programs.